Join us for a live Facebook chat with Lisa Scottoline, bestselling author of our current SheKnows Book Club pick: Save Me. Save Me is our current SheKnows Book Club pick for 2012, and we’re thrilled to give you the chance to chat with author Lisa Scottoline live on Facebook this week. Join Lisa and the SheKnows Book Club bloggers on Facebook on Thursday, March 29, at 5 p.m. PST (8 p.m. EST) for 1 hour. Lisa Scottoline will respond to your questions and comments on Lisa Scottoline’s Facebook page. Come by and chat with this beloved author — ask her questions about Save Me, or just tell her how much you adore her many wonderful novels. Save Me grips you tightly from page one and refuses to let go as you take an emotional and thought-provoking journey with Rose McKenna — a mother who makes a split-second decision that changes everything and begs the question — what would you have done if you were her? The day Rose McKenna volunteers in her daughter’s cafeteria is the day everything changes. Rose wants to help out in order to keep a close eye on her daughter, Melly (born with a facial birthmark), who has become the target of insults from mean girls. Rose wonders if she should step in to protect her daughter or is making the situation worse. Rose is about to get involved when the bully attacks her daughter, yet again — but right then, the unthinkable happens. Rose finds herself in a nightmare, faced with an emergency decision that no mother should ever have to make. What she decides derails Rose’s life and jeopardizes everyone she holds dear, until she takes matters into her own hands and lays her life on the line to save her child, her family, her marriage — and herself. 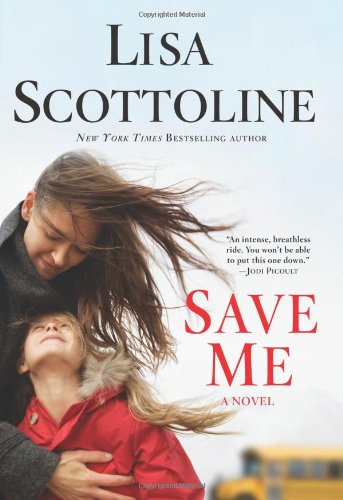 Called one of Scottoline’s most powerful and stirring novels yet, Save Me, will have you biting your nails until the very last page.